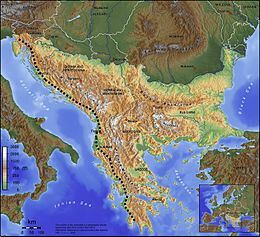 Southeast Europe or Southeastern Europe (SEE) is a geographical region of Europe, consisting primarily of the coterminous Balkan Peninsula. There are overlapping and conflicting definitions as to where exactly Southeastern Europe begins or ends or how it relates to other regions of the continent. Sovereign states that are most frequently included in the region are, in alphabetical order: Albania, Bosnia and Herzegovina, Bulgaria, Croatia, Greece, Kosovo,[a] Montenegro, North Macedonia, Romania, Serbia, and Slovenia. The first known use of the term "Southeast Europe" was by Austrian researcher Johann Georg von Hahn (1811–1869) as a broader term than the traditional "Balkans". This concept is based on the boundaries of the Balkan peninsula. The countries that have been described as being entirely within the region are: Albania, Kosovo,[a] Bosnia and Herzegovina, Bulgaria, Montenegro, and North Macedonia. Turkey – only East Thrace is included. The Stability Pact for South Eastern Europe (SPSEE) included Albania, Bosnia and Herzegovina, Bulgaria, Croatia, Kosovo, Moldova, Montenegro, North Macedonia, Romania and Serbia as member partners. The South-East European Cooperation Process (SEECP) includes Albania, Bosnia and Herzegovina, Bulgaria, Croatia, Greece, Kosovo, Moldova, Montenegro, North Macedonia, Romania, Serbia, Slovenia and Turkey as member partners. The Southeast European Cooperative Initiative (SECI) includes Albania, Bosnia and Herzegovina, Bulgaria, Croatia, Moldova, Montenegro, North Macedonia, Romania, Serbia, Slovenia and Turkey as member partners. The EU-co-funded South East Europe Transnational Cooperation Programme includes the whole territory of Albania, Austria, Bosnia and Herzegovina, Bulgaria, Croatia, Greece, Hungary, North Macedonia, Montenegro, Moldova, Romania, Serbia, Slovakia, Slovenia, and parts of Italy and Ukraine as part of the "programme area". Studies of the World Bank treat Albania, Bosnia and Herzegovina, Bulgaria, Croatia, Moldova, North Macedonia, Romania and Serbia as the eight South Eastern European countries (SEE8). A 2006 publication of the World Health Organization (WHO) and Council of Europe Development Bank (CEB) listed Albania, Bosnia and Herzegovina, Bulgaria, Croatia, North Macedonia, Moldova, Romania and Serbia and Montenegro as 'south-eastern European countries'. The World Bank does not include the EU countries in its reports, and lists only Albania, Bosnia and Herzegovina, Kosovo, Montenegro, North Macedonia, and Serbia (SEE6). CIA's The World Factbook lists Albania, Bosnia and Herzegovina, Bulgaria, Croatia, Kosovo, Montenegro, North Macedonia, Romania, Serbia and Turkey (only European part), but not Greece and Moldova, as geographically part of Southeastern Europe. UNHCR's Regional Office in South Eastern Europe currently lists Albania, Bosnia and Herzegovina, North Macedonia and Montenegro as part of 'South Eastern Europe'. ^ a b c Kosovo is the subject of a territorial dispute between the Republic of Kosovo and the Republic of Serbia. The Republic of Kosovo unilaterally declared independence on 17 February 2008, but Serbia continues to claim it as part of its own sovereign territory. The two governments began to normalise relations in 2013, as part of the Brussels Agreement. Kosovo has been recognized as an independent state by 102 out of 193 United Nations member states. 10 states have recognized Kosovo only to later withdraw their recognition. ^ a b Jelavich 1983a, p. 1-3. ^ Harry G. Broadman (2004). Building Market Institutions in South Eastern Europe: Comparative Prospects for Investment and Private Sector Development. World Bank Publications. p. xviii. ISBN 978-0-8213-5776-7. ^ World Health Organization. Regional Office for Europe; Council of Europe Development Bank (2006). Health and Economic Development in South-eastern Europe. World Health Organization. pp. 5–. ISBN 978-92-890-2295-8. ^ "South East Europe Regular Economic Report". World Bank. ^ See "Albania". CIA. , "Bosnia and Herzegovina". CIA. , "Bulgaria". CIA. , "Croatia". CIA. , "Kosovo". CIA. , "Macedonia". CIA. , "Montenegro". CIA. , "Romania". CIA. , "Serbia". CIA. , "Turkey". CIA. ^ See "Greece". CIA. , "Moldova". CIA. ^ "Regional Office in South Eastern Europe - Global Focus". reporting.unhcr.org. Paul L. Horecky (ed. ), Southeastern Europe: A guide to basic publications, Chicago: The University of Chicago Press, 1969. Jelavich, Barbara (1983a). History of the Balkans: Eighteenth and Nineteenth Centuries. 1. Cambridge University Press. ISBN 9780521274586. Jelavich, Barbara (1983b). History of the Balkans: Twentieth Century. 2. Cambridge University Press. ISBN 9780521274593. Ekavi Athanassaopolou (18 October 2013). Organized Crime in Southeast Europe. Routledge. pp. 6–. ISBN 978-1-317-99945-4.